He’s not there, so he won’t get fined. SEATTLE SEAHAWKS STAR running back Marshawn Lynch has been ruled out of tomorrow’s NFL wildcard playoff away to Minnesota Vikings. The notoriously tight-lipped yard-maker was tipped to start all week by head coach Pete Carroll, but a late decision was made that he would not travel east with the Super Bowl runners-up. “Following the final practice of the week on Friday, Lynch felt like he could not play,” said a statement on the Seahawks website. Lynch underwent surgery on an abdomen problem in November. After a promising week of training, Carroll admitted yesterday that there was a chance ‘Beast Mode’ would be unable to operate at full capacity. But to leave him out of the travelling party altogether for a playoff game seems like a drastic measure. That optimism was quashed by Lynch’s decision to not risk further injury and the running back duties will again be shared by Christine Michael and Bryce Brown who have plenty of experience this season thanks to Lynch’s injury struggles. Can the Texans and Bengals upset the odds on Wild Card weekend? Email “Beast Mode deactivated: Seahawks hit the playoff road without Marshawn Lynch”. 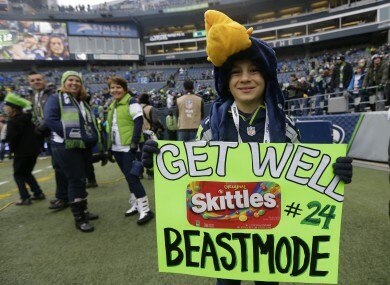 Feedback on “Beast Mode deactivated: Seahawks hit the playoff road without Marshawn Lynch”.